With no recent announcements on whether the promo will be extended further, it's time to think back on our expenses on ImmortalTxt20, a Globe text promo that offers 75 texts to Globe/TM and 10 texts to other networks for only Php 20.00 and without expiry. How to register to ImmortalTxt20? Registration is done by texting Immortal20 to 8888. If you send messages to other networks often, normal load is best for you. 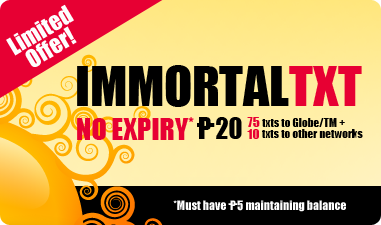 With ImmortalTxt20 having only 10 messages available for Php 20.00, that means you spend Php 2.00 for each message sent. 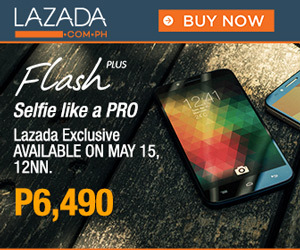 Whereas on using normal load you only spend Php 1.00 per message. may be higher than ImmortalTxt20 (Php 0.27 per message), but it's actually more worth its value thanks to the 5 minutes of call. In conclusion, you're better off registering to Immortal Call+ instead and set aside Php 10.00 for messages to other networks. Don't forget there's a catch in using both Immortal promos of Globe: the maintaining balance of Php 5.00 regular load. Not only it is hefty, but it also means you need to buy regular load every now and then. The no expiry feature is not exactly something to be happy about because the maintaining balance itself does expire.